Last week, there was a major public outcry in response to reports that three immigration officers had been recommended for termination in the wake of the Penner Passport Scandal, and this week, two senior officers from the Nationality Section of the Immigration Department are now under scrutiny following an administrative investigation into the abovementioned scandal. Amandala understands that Gordon Wade, who heads the Records section, and the Counter Supervisor Ady Pacheco, who is the second in charge, are being asked to answer specific questions regarding missing nationality files. An official report on the circumstances surrounding the scandal was completed on October 4, 2013. 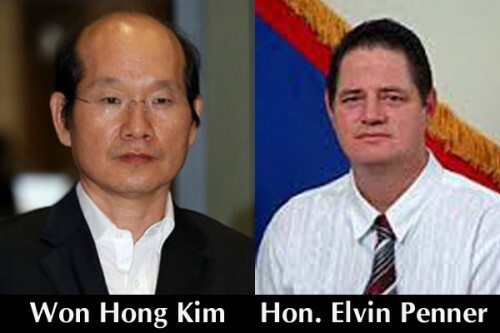 It contains reports of interviews done with staff members at the Nationality Section who supposedly played roles in the issuance of a Nationality Certificate for the South Korean businessman, Won Hong Kim, who was in a Taiwanese prison when his nationality certificate and Belizean passport were issued on September 9, 2013. At the time, former Minister of State in the Immigration Ministry, the now ousted Hon. Elvin Penner, delivered the incomplete nationality application and saw it through its processing stage. So far, Penner –who was at the center of the fiasco – remains untouched by any investigation. While that report and those recommendations were made by Marin on October 4, 2013, we understand that the report was not forwarded to the CEO in the Ministry of Immigration, Mrs. Candelaria Saldivar-Morter, until December 20, 2013 – more than two months later. On January 10 of this year, Saldivar reportedly responded to Marin and asked her to seek a response from the officers who were named in the report, specifically the head of the Records Section, Gordon Wade, and the Counter Supervisor, Ady Pacheco. Reliable information suggests, however, that up to this time, the officers in question have not yet officially seen that report and have not been asked to respond to the findings. Upon viewing the report, the two senior officers purportedly have a specific allotment of time within which they must answer, and if their answers are not satisfactory, they could also be recommended for termination. With regards to the report – which was leaked to the media – we learned that as of this week, all Immigration officers are being asked to sign an oath of secrecy, and are being warned that their phone records can now be examined.